You are here: Home / Blog / Cosmetic Dentistry / An All on 6 dental implant patient reviews our work! Thank you all very much. Everyone was gentle and kind, I appreciate the expertise of everyone. There was a point Elaine had a problem with it so she came back to us for her warranty. We obliged fixing what was off and she was ready to go with a smile. This is important for you to know. We offer a 5 year warranty on our implant work unlike many other practices. We want you to have peace of mind when you go back home. As long as you have followed our dentists care and hygiene guidelines we will be able to replace an implant without much problem. Remember that you need to come every year so we can give your denture bar a full professional cleaning. Get in touch with us right a away so we can give you the specifics. The age of technology has brought us all together. Now is possible to check services on other places and it doesn’t matter that we are countries apart or even your age. Every day we greet all kinds of patients who come from USA and Canada; young, old, married, single, with or without children. Most of them have heard of us thanks to our website or through our Facebook page and checked our almost 200 video testimonials on YouTube where we ask other patients to talk about their own experience. They wanted to share them with other people who might be looking for a solution for their dental problems to come and smile again. If you want to know more about what Cancun Cosmetic Dentistry can do for you call toll free from USA and Canada 1-800-701-6039, or if you are already on vacation in Cancun and want to meet us, you can call us for an appointment at the following local number (998) 1-40-51-25. 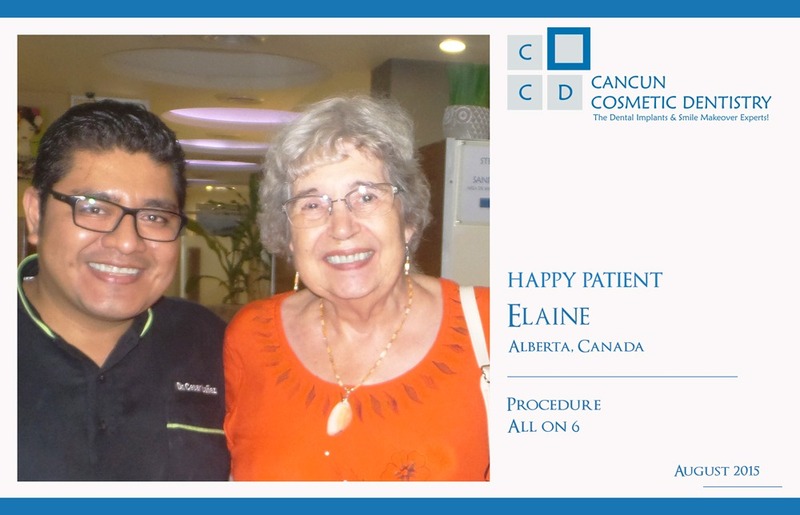 Another great case of a Happy Patient in Cancun Cosmetic Dentistry! How can I find the most affordable cosmetic dentistry treatments? The 7 things to buy during your vacation in Cancun! Another Dental Implants happy patient review!